Have Retirement. Will Travel. : What? We're Not In High School Anymore? This is yet another delayed post but I'm making progress in getting caught up. With autumn in the air and college football season well underway, we spent most Saturdays at Macky and Donna's house (my brother and sister-in-law), watching the games. After a flurry of hospitalizations in September, Macky has been home and doing well for several weeks. We've been enjoying homemade pies that Wayne and I pick up from New Market BBQ on the way to their house. We devour feasts of wings, pizza or hamburgers too. The silver lining to having this family illness is the long leisurely visits we've enjoyed. It is intentional that I have not posted pictures of Macky. I don't want to remember him looking different than he's always looked. He has always been a handsome and healthy looking man. 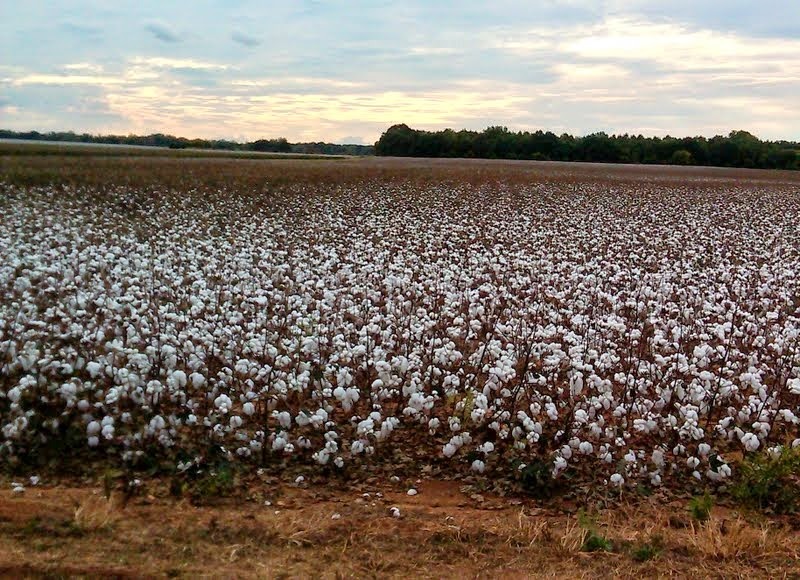 The very common sight of cotton in rural Alabama and Tennessee. This field is ready for picking which, nowadays, is done by machine. But by the third week of October, Wayne and I began thinking about moving along. With family in middle Tennessee and central Alabama, we're anxious to see all of them too. Later we'll we drive on to south Florida for the winter months. Hastily, and with the help of Facebook, some high school girlfriends agreed to come by the campground for lunch the week before our departure. There were just five of us girls, Wayne and one other husband. The day was perfect -- warm in the sunshine, cool in the shade. We spent several hours poring over old high school yearbooks and laughing at everything in them. Sadly, as we've grown older, the deaths of teachers and our own parents had to be reported too. Lila and her husband, Billy and me. Didn't realize who Billy was until today but I knew him long, long ago. The famous K-Mart pose with my high school pals. I sure enjoyed this reunion and look forward to another but under different circumstances, of course. By late afternoon, my school friends were gone and I looked up to see our friends, Pam and Ernie pulling into the campground. They've just finished a repair trip to Tiffin at Red Bay and are on their way home to Maryland. We were hopeful they'd get to swing by to see us. Pam and Ernie and me. Ozzie is in my lap. Lexie is in pop's chair. Pam and Ernie and Wayne and I finished off the food I'd gotten for lunch. Afterward, we enjoyed a campfire and the evening air was cool enough to really enjoy it. We're looking forward to a couple of days catching up with Pam and Ernie as they're considering going full-time in their motorhome.